Over the last couple of weeks, I have really grown to love grayscale and monochromatic looks, even though I had previously thought that it was SO boring and unimaginative. Anyway, I guess what matters most, is not the colours of the items you’re wearing, but what you pair them with! 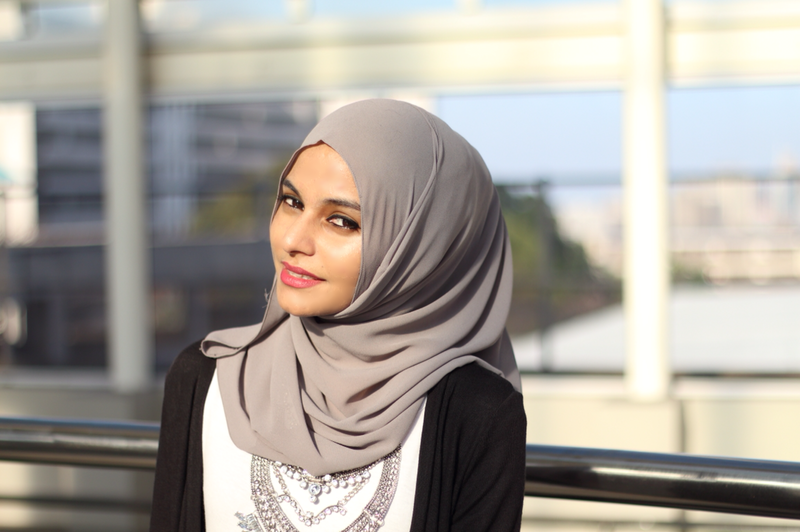 This super soft Sofia Instant Sheyla was the inspiration for this look. 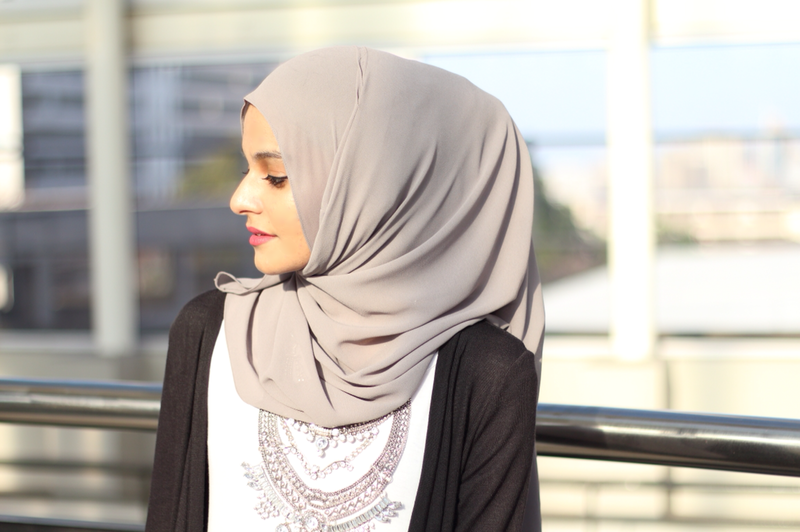 I love the fact that this Sheyla/scarf is just so effortless and easy – it slips on, doesn’t require any pins, unless you drape it like I did, is just so flowy and looks frikken fab – and it’s that effortlessness, ease and gorgeousness that I wanted to mirror in this look. I paired this super soft Sofia Instant Sheyla with this simple white midi-dress. I love the fact that even though the dress has an insanely high slit on the side, it’s still appropriate and modest. Another plus is that it can be dressed up or down, which is great for transforming looks from day to night. Considering that my figure is really petite, I love the ‘layered look’ to basically hide that fact. For this look, I opted for this light-weight, double-pocketed maxi cardigan which is perfect for us modest dressers. It covers your bum and arms, which means sleeveless shirts and short-ish tops won’t be an issue, if you’re throwing this over. I finished the look off with a plain pair of black skinny jeans (leggings just wouldn’t have worked due to the slit), a pair of pointed D’Orsay pumps which was unfortunately camera-shy on shoot-day and my favorite silver statement necklace which you guys have already seen in my Eid OOTD. It’s just a simple and classy look and besides you can never go wrong with black, white and a little bit of gray! Thanks for the great posts Raeesa. Could u please tell us about your makeup in this post! It looks fab maShalah. Catrices Matte About Pink Lipstick. I’m not using blush but I did sweep some of the Stila Kitten Eyeshadow across the top of my cheeks as a highlight. I’m using the shade Medium Beige buut I’m not sure if it’s good for dark circles or not as I don’t have any 😁 But maybe test it out in store first?